Not that I am surprised. Every once in awhile, he gets teary eyed. he missed out on while at work. Teary. Busch Stadium on opening day. Teary. Steve getting teary eyed is the very reason I knew I was going to marry him. It was back in 2000. We were in college. softball players, all three of us, together at the same college. It was about the strong bond my family has. When I glanced over at him, he was TEARY eyed. I knew at that exact moment that I would marry him. She learned to play the game on a flat acre of land behind her childhood home in Missouri, the same spot she once lost a tooth in a trampoline mishap. While following her three older sisters everywhere they went and wanting to emulate them in every way, Maggie Viefhaus learned how to play softball. The sport eventually brought Viefhaus to Michigan as the team’s third baseman, but the Viefhaus family games might have been just as competitive. The games had atypical talent. The Montreal Expos drafted Randy in the third round of the 1970 MLB Draft. Her uncle, Stephen, was a third-round draft pick of the Detroit Tigers in 1974. Maggie’s three older sisters, 30-year-old Marta and 28-year-old twins Adie and Haley, all played softball at Southern Illinois. The childhood games let Viefhaus be with her sisters and father. They also taught her a lot about softball. Randy threw especially hard one day, intentionally trying to strike Viefhaus out. The left-handed Viefhaus stood at the plate at her grandmother’s house, hoping to make contact. “I just closed my eyes and swung as hard as I could,” Viefhaus said. “And I’ve never seen a Wiffle ball hit so far. You can’t hit Wiffleballs very far and this one went shooting over the fence. Since then, she’s elicited that reaction a lot. Viefhaus, a senior, is tied with first baseman Dorian Shaw for the Michigan lead in home runs with 17. In her career, she’s fourth all-time at Michigan with 39 behind Shaw, Jessica Merchant and Samantha Findlay. The 5-foot-10 senior leads Michigan with a .396 batting average and 10 doubles. She’s tied with Shaw for the team lead with 52 RBIs. It wasn’t always this way at Michigan for Viefhaus. Even though she’s started every game in her four years at Michigan while hitting .277 as a freshman and .306 as a sophomore, something felt off during her junior year. She consulted Randy and Michigan softball coach Carol Hutchins, searching for answers. “Sometimes, your expectations get the best of you,” Hutchins said. “It wasn’t like she wasn’t a good player but basically I’m like ‘Man, go for it. You’ve got to go for it.’ She came here to go to the Series and go for a championship. Randy had instilled a message of trusting her coaches. Her coaches, meanwhile, kept pushing confidence. “I’ve played my whole entire life and it was never this hard,” Viefhaus said. “I just had to trust myself and my previous experience and years around the game. 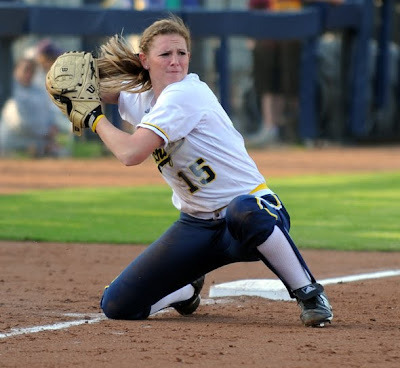 On Saturday, Viefhaus will play her final game at the Wilpon Softball Complex, a 7 p.m. meeting against Michigan State. The entire backyard crew - parents, sisters, brothers-in-law, nephews and nieces - is scheduled to appear. It’s the beginning of one last goodbye for this generation of Viefhaus players. “Mags is the finale,” Randy said. “It’ll be a little sadness there because ‘Hey, we’re done with all the kids.’ Now start with the grandkids. 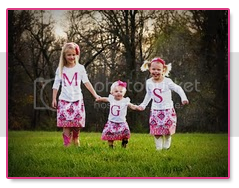 And Maggie says her niece follows her around and emulates her, just like Maggie did to her sisters. Can you say TEARY EYED?! We are so proud of you Maggie! This brought tears to my eyes too! Great story! Amazing family! Okay, I am totally crying!!!! What a beautiful article. It brought me back to my senior year of college soccer & I remember everything about our last home game. Such a wonderful experience. Your family is awesome & so talented! The paragraph of the article gave me chills. We've had season tickets to watch the UofM softball games for a few years now. Maggie is awesome! This is so sweet Marta! You girls are so lucky to all have each other and to have softball as a common interest! I love the relationship you guys have! Ah, this made me teary eyed. How cool is this! Good luck to her! This is so precious. I hope her last game is amazing! What an awesome tribute to her and your incredible family. So sweet! What agreat article! That's awesome. What a neat family bond.